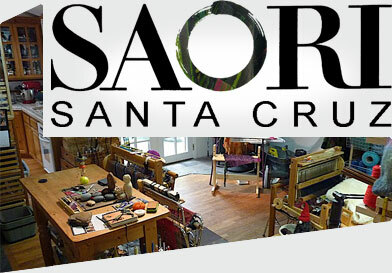 Saori Santa Cruz is a Saori weaving studio, offering the following classes: weaving, learning how to spin fleece into yarn, dyeing, processing fibers and yarns for spinning or weaving, and how to sew and create garments. I am dedicated to helping develop creativity in children and adults and empowering them to find their true expression through hands-on individualized classes in: Saori weaving, spinning on spindles and wheels, dyeing, combing and carding fibers and unique techniques in garment sewing. No previous experience needed. Saori floor looms, Louet wheels, Louet drum carders, and sewing machines provided. 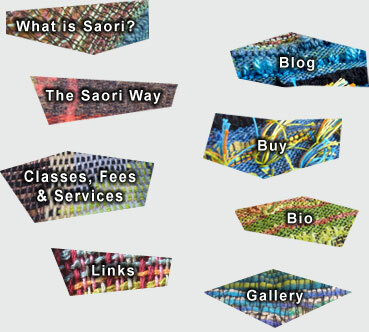 Design and sew garments using your Saori weavings. Freeing the inner self with original style, sparking initiative, and a conviction to helping you discover your unique individuality is what Saori philosophy is about. Honest weaving, no rules weaving, joyful weaving. Saori looms and equipment and yarns, Louet wheels, fibers , carders, Glimakra benches and equipment, and yarns, Nancy's Knit Knacks ball winders, swifts and tools, custom made loom bags.